Butternut Pumpkin or Winter Squash is a herbaceous, creeping and vine-like annual that trails along the ground or climbs by tendrils. 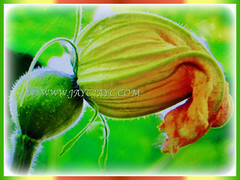 It is popularly grown for its edible young flowers, leaves, shoot tips and seeds. 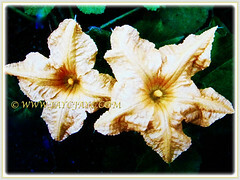 Botanical Name: Cucurbita moschata (syn. 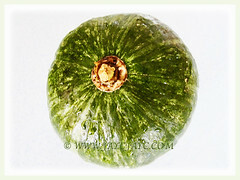 : Cucurbita pepo var. 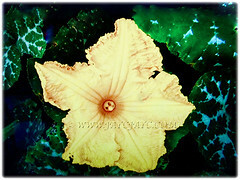 moschata, Cucurbita colombiana, Cucurbita macrocarpa). Common Names: Pumpkin, Butternut Pumpkin, Butternut/Winter Squash, Cheese Pumpkin. Etymology: The genus name Cucurbita means gourd in Latin. The specific epithet moschata means musky. Origin: Native to Tropical Asia, Central America and northern South America. Plant type: An ornamental and vine-like annual. 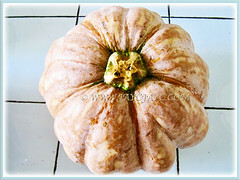 Features: Cucurbita moschata is from the genus Cucurbita that consists of 13-30 accepted species of plants. A herbaceous, creeping and vine-like annual that trails along the ground or climbs by tendrils, reaching 23-46 cm tall and spreads 3.1-4.6 m wide. Its leaves are shallowly- to deeply-lobed, broad-ovate to kidney-shaped with toothed margins and cordate bases that often have white spots on the veins. Green and velvety-hairy leaves are 25-30 cm long and 20-25 cm wide, and are held onto 30 cm long petioles. The stems are hard and 5-angled with grooves and are covered with white hairs. A monoecious plant with both showy female and male flowers. Single axillary and wrinkled flowers are creamy white to orange-yellow in colour. Typically, the male flower is borne on a 16-18 cm long floral stalk with 3 stamens while female flower is borne on a 3-8 cm shorter stalk with 3 two-lobed stigmas. Its fruit is a pepo with a hard and 5-angled, grooved fruit stalk and enlarged where it is attached to the fruit. 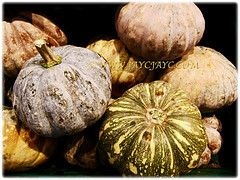 The fleshy Pumpkins come in many shapes, sizes and colours as there are many varieties and they cross-pollinate readily among themselves and with the squashes. Each fruit contains large numbers of yellowish-white seeds which are egg-shaped to elliptical with a thickened margin. Mature seeds are orange-brown, yellowish brown or yellowish white. 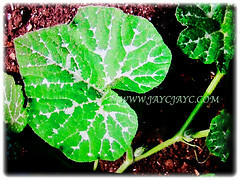 Culture (Care): Cucurbita moschata or Pumpkin can be grown easily with least maintenance. Moisture: Moderate water requirements. Although it likes moist soils, it does not do well in waterlogged conditions. Others: Provide a trellis or pergola to allow the vine to climb to maximise production of fruits. Once every fortnightly, fertilise the vine with manure to stimulate growth and fruit production. Generally free from serious pests and diseases. However, it is susceptible to bacterial wilt, fusarium wilt, blossom end rot, downy and powdery mildew. Also, watch out for aphids, mites, cucumber beetles, squash bugs and vine borers as well as stink bugs and pickleworm. Cucurbita moschata or Winter Squash is a creeping and vine-like annual that trails along the ground or climbs by tendrils, producing edible young flowers, leaves, shoot tips and seeds. Their white to orange-yellow flowers bloom in late spring. Save the seeds for propagation. Seeds may be planted outdoors when soil temperatures have risen to at least 18.33°C, typically about the time of last spring frost date. Seed can also be started indoors about 3 weeks before the last spring frost date, with young plants set out after last frost date. Harvest during fall for culinary uses. Propagation: Easily propagated from seeds. 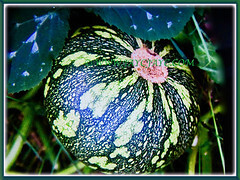 Gourds will be ready for harvesting between 90-140 days after sowing the seeds. 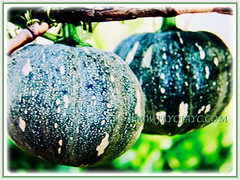 Usage: Cucurbita moschata or Cheese Pumpkin will be excellent on trellis, arbour or pergola. Grow it in your garden to enjoy its edible young flowers, leaves, shoot tips and seeds. Its seeds can be cooked and eaten. Oil can also be extracted from the seeds. The immature and mature fruit is eaten cooked as a vegetable and used in soups in South-East Asia. 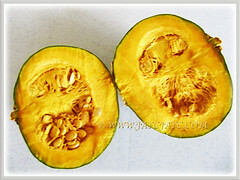 It is also used in desserts, pies, cakes, tempura pumpkin, steamed pumpkin cake, etc. The large variety of pumpkins are used for carving into a Jack O’lantern to celebrate Halloween.